With its boats, canals, islands, ancient mansions and mysterious alleyways, Venice is like a child’s fairytale come true. 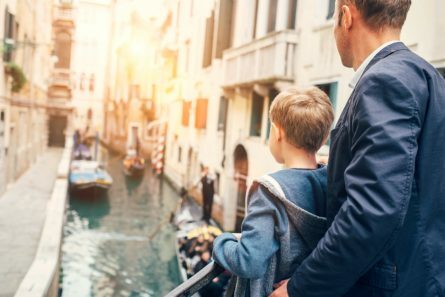 This Venice tour for kids offers an entertaining and informative look at Venice’s illustrious maritime past that is fun for the entire family. You’ll begin at the elegant Piazza San Marco, where we will marvel at the impressive Basilica San Marco and the Doge’s Palace. Using the carvings on the exterior of the Doge’s Palace you will learn about daily life during Renaissance Venice and the professions and trades practiced. You’ll also marvel at the exquisite mosaics on the facade of Basilica San Marco and the hidden symbolism inside the zodiac symbols on the San Marco clocktower. A visit to Venice is not complete without viewing the lagoon from the water. You’ll take short boat rides to wonderful sites such as the Church of San Giorgio Maggiore. At its bell tower, you’ll be in awe of the stupendous bird’s-eye view of the city, the lagoon, and the elegant private yachts in the harbor below. Next, at the old boat-building yard of the Tramontin family – the only one of its kind remaining in Venice – you’ll learn everything there is to know about gondolas, Venice’s iconic watercraft. You will discover the fascinating art of gondola making, understanding just how many artisans are involved with forming the different pieces needed for this iconic mode of Venetian transportation. You’ll also visit the massive brick Arsenale, the shipyards famous for the construction of the huge ships that made Venice the “Queen of the Seas.” The shipyard where war galleys and trading ships were built, you will learn about the history of Venice as a maritime empire, with outposts in exotic lands whose merchandise, from silks to spices, help inform the culture of Venice. Enjoy a 3-hour stopover in the beautiful town of Bologna during this sightseeing transfer from Florence to Venice in a luxury Mercedes.